First Time to the Balboa Park Rube Powell Archery Range? 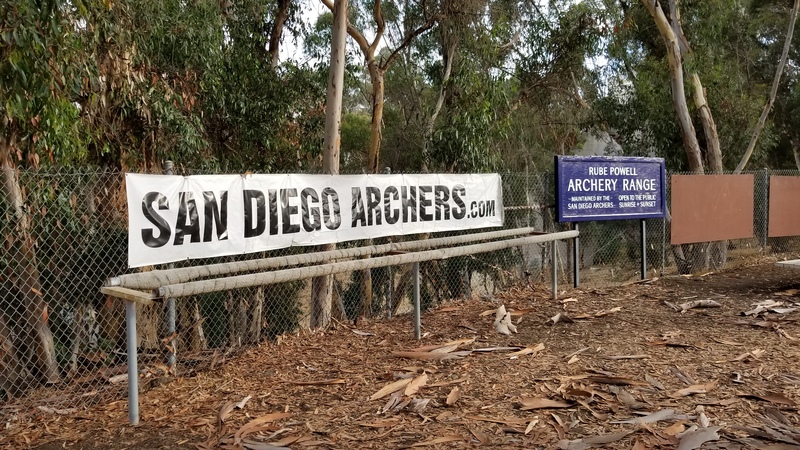 This unique archery range sits on ~30 acres in the heart of beautiful Balboa Park. It is surrounded by the 163 Freeway to the west, San Diego Zoo to the north, the Old Globe Theater and Museum of Man to the east. The entrance to the Range is on the south side of the Cabrillo Bridge (Laurel St.), near the SW corner of the Alcazar Gardens Parking Lot. It’s a walking course, just like a golf course. Always walk in the proper direction! to take with you on your first trip to the Range. The Balboa Range also has a small practice area at the entrance, with target butts at 10, 20, 30 and 40 yards. The Balboa Range is open to the public from sunrise to sunset, 365 days/year for just a $2 day use fee. 14 targets are open year-round (Targets #15-28). The remaining targets are only open during tournaments, held ~twice each month on the 1st & 3rd weekends. The first open target (#15) is on the north side of the Cabrillo Bridge, ~5-10 minute walk from the entrance/practice area. Each target has yardage markers (tabs) varying from ~20 feet to 80 yards, depending on the target. This is a NFAA-Certified course! Posted on December 25, 2016 by archer1.